Do you want to make own logo for your blog/website or any purpose? Well, In this article I will show you how you can make your own logo free using online logo maker site. But firstly you should know what is a logo? The logo is a sign of any brand or business that is used to identify brand products and services. Anyone can recognize brands by their logo. So Logo must be effective. Have a look best sites for image quotes generator where you can make your own motivational quotes images. In this post, I will share the best site to make your own logo totally free. Using this site you can make an eye-catching logo that makes anyone memorable. If you have started your brand selling services then you should make a relevant logo for your services that must be a unique logo and easily memorable logo for anyone because Logo tells about the brand. Suppose I say “Google”. What you remembered..? Google Logo..!! Ya, of course, Google logo. That means Brand Logo is the identity of any brand and services. Logo design must be the killer type. 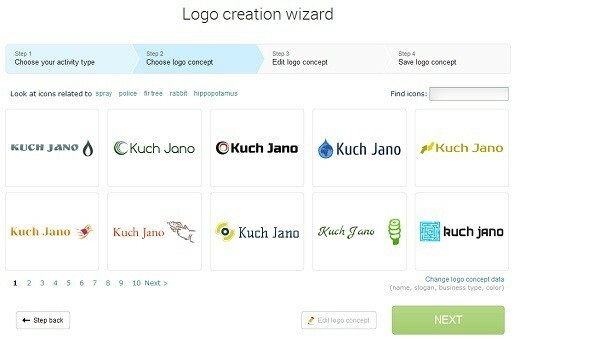 If anyone sees your created logo then he must say Wow..
Below sites are the best free online tools to make your own logo. So create a custom logo for your small business, brand or even if you are a blogger or webmaster then you can use these sites to make an extraordinary logo for your blog/site or Client. Follow below sites to create logo online for free. Do you want to make Professional type logo free ?? Then Canva.com/create/logos will help you in creating a pro type logo for totally free. Canva provides many pro logo templates designs for free to use while making logos. Canva has million of images and vector illustrations in its library. You can choose any of them to design your logo. All images of the canvas are high quality so created logo looks like a pro logo. Almost all HQ images and other elements are free to use and also there are some premium elements (pay less than one $). Logomaker.io is 100% free logo creator website where you can make your logo without paying anything. It provide best logo making tools. Here you can choose 6000 professional business logo’s and custom with your business/name and create an unbelievable logo. It also provide full with options that enable you to make an appropriate logo for your business. OnlineLogoMaker.com is one of the best sites for designing a logo for totally free. Online Logo Maker website has many tools for creating logo as unlimited fonts, unlimited symbol, and many customize tools for making awesome design logo and download it in PNG file or you may share that logo on Social media. TheFreeLogoMakers.com is another website to create logo design. Free Logo Makers provide basic user interface and limited design templates. It gives nice looking logo and here you can get high quality logos to many sizes in transparent format by paying some money. LogoGenie.net is the best online tools to create fabulous logos for free. Any one can easily make their logo with this site. You can say this is user friendly website for logo making. Here Only you have to choose category of logo and desired name of logo and submit. It will automatically make Awesome 🙂 logo for your services. Logo Genie is fully customized logo creator site. LogoGarden.com website provides DIY editor with many customized tools to create logos. The main part of this site is, gives awesome Symbol effects, shadow, reflect distress and shine. Make well design logo and download after register on a site. Logaster.com is Free Logo Maker and Generator Website which provides totally free. It’s is having good User Interface to create logos fast and effective way. It provides high quality logo in a minutes but if you want higher resolution image then you can pay 9.99$ and get full access of it. Logotypemaker.com is awesome website to make logo design for freeware. This site provide you professional logo designs. En ter your name and hit submit Then next page it will show the full collection of name logos here you can change the categories of logo. Flamingtext.in is simple and best logo making tool online for free. This site is very good UI and user friendly. Only type your desired name and it will present the collection of logos that you may like. Choose one of created photos from the collection and customize them with fonts. It also provide GIF animated logo. FreeLogoServices.com is another logo creator website which is best alternative of other logo websites. It provide many options to crate logo. Only Select logo name and Categories and Hit on Submit. It will bring the best logo for you. and after this you can edit symbol or text color. Logodesignengine.com Website gives professional look logo with full edge. It has very limited options for logo creating. You may try this logo website and download logo without create account. You can share this list with your friends so that they can also be able to make their own Logo Online. These are Logo creator sites list. I hope you liked these logo designing sites. If you are using any other logo creator site or Facing problem in making logo then Let us know in comment section. you are really doing a great job of giving opportunity to those who are really good at art as well as thinking and can relate the topic with the art and make a perfect blend and an outstanding logo….keep up the good work….